There have been many blacklists in our times since humans began to record history. Some so meager they never left their mark. Those that did inspire enough fear to where they are barely uttered above a whisper. One might wonder what the definition of a blacklist means. Blacklists are lists of people who have fallen out of favor, under suspicion, accused, to be feared, dangerous, to be rejected, and sometimes captured. 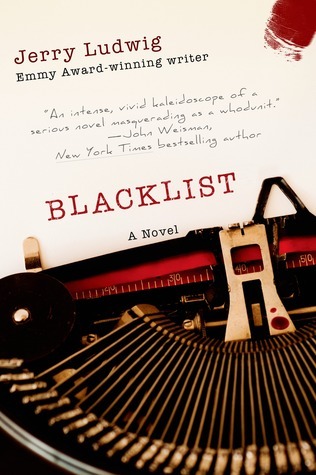 Blacklist by Jerry Ludwig covers just one such list of names. Perhaps the most famous of all them. The Hollywood Blacklist. It is often covered in our history books, but not much time is ever spent on it when we get to the subject of the Cold War Era. For the umpteenth time a witch hunt was conducted on North American soil. The hunters this time was the House Un-American Activities Committee, and the witches was Hollywood. Between the late 1940’s, and 1960 HUAC along with Senator Joseph McCarthy went after American citizens who were thought to be Communists, or linked in any way to them. Most of their effort was aimed at Hollywood claiming Communists had began to brainwash the young minds by using films, radio, and TV. With that in mind we can now step into the world Jerry Ludwig has been so kind to invite us to. Blacklist begins in October 1959 where we are introduced to one of the three essential characters. David Weaver has just arrived back in the United States after being forced out of the country earlier in his life with his family due to his father, Teddy Weaver, being put on the Blacklist. He has come home to bury his father in Hollywood, and almost immediately is put on high alert due to his encounter with our second essential character FBI agent Brian McKenna for the first time in years. Once settled back in town David must navigate his way through old friends, enemies, the world of Hollywood, and his way back to his childhood sweetheart, our third character, Jana Vardian. At first David starts to see a future hoping things have changed. However, that quickly changes as old enemies rear their heads. Old friends become questionable as bodies start to show up on the streets that were once connected to his father. Soon it spirals out of control to where David now has the target on his back, and hunted by the same man that drove out his family before, McKenna. Divided into two books Blacklist is a very well paced out novel. It does not give you the details immediately to you. Therefore it appears to start off slow for the reader when really the author is merely setting up the board, the game pieces, and the players. I found it enjoyable that the author decided to divide the narrative among David Weaver, Jana Vardian, and Brian McKenna so we could see different perspectives. Beginning in book one we see the intensity between David, and McKenna that helps fuel the story. As David, and Jana flashback we are drawn into their lives wanting to understand what happened to each as they were separated. The setting Ludwig gives us resembles the film noir gene in which at first you think you know the game, but in reality you never knew the rules to begin with. Continuing to be guided on one begins to notice the FBI agent, Brian McKenna, has a similarity to Bogart in his noir films. It is something I find appealing since I am a Bogart, and Bacall fan. Speaking of Bogart, and Bacall the reader does find themselves rooting for David and Jana to get together as a couple. While the scenes are romantic they are that of the modest kind which makes you appreciate them all the more. Moving along towards book two is when the action begins to pick up. Right away your mind begins to wonder if David has truly done something horrid, or if someone else has. You begin to think you have figured it out, but when you get close to the end you realize you have been chasing the wrong person. The only cons with this novel is that the author starts with a notation from Wikipedia. Most of us know that Wikipedia is not exactly the most reliable source since anyone can edit anything to their liking. Although when you find out about the author it makes you wonder why they felt the need to include it. Perhaps it was placed to help educate the reader , or remind them. The other con is sometimes it repeats itself a little too often until you realize these details that are repeated are essential. In conclusion I was happy enough with the novel. It was an enjoyable ride through this time in our country. No doubt it has it all to make a wonderful movie some day with its intrigue, mystery, action, suspense, historic perspective, and thrilling storytelling style.